The Sealyham Terrier is one of the calmer terriers that exist, but, like any terrier, it is always ready for action. It is excited to dig and chase and is very curious by nature. This leads the dog to many investigations amongst its surroundings. It is friendly by nature as well, and it loves to play. It can be very outgoing around its family, but when strangers are in its direct vicinity, it can tend to clam up and act in a more reserved manner. Like most terriers, it has a stubborn side, but for the most part, it is very obedient. 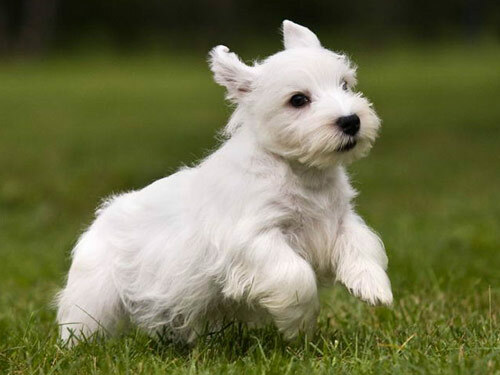 The male Sealyham Terrier can weigh as much as 23-24 pounds, and the female can weigh anywhere from 18-22 pounds. This allows the breed to be well-suited for most homes, including smaller homes, as it does not require as much space. Requirements for exercise are also much less demanding than other types of terriers. A short, moderate walk or a quick game or training session is enough to keep this dog exercised on a daily basis. This breed is curious by nature and has been known to follow its nose, so if you let it off its leash, its important that it is watched. The Sealyham Terrier is best suited indoors, as opposed to living outdoors full-time. If indoors, it is also beneficial that it has access to a yard, but necessary. Its coat can get long if it is not clipped and shaped every few months. Also, this breed has a shiny white coat so it is important to keep its coat clean to avoid the collection of dirt. It needs to be brushed about three times per week. Unlike most terriers, the Sealyham Terrier’s main health concern tends to focus around the eye. Although many other terriers also have eye issues, their issues don’t start their. Chronic Hip Dysplasia and Patella Luxation are some serious conditions that effects other breeds that the Sealyham somehow avoided during its evolution. It really only has minor health concerns surrounding this breed, such as retinal Dysplasia, lens luxation, and deafness. It is suggested to test your terrier every other year for eye health to ensure that its eyes are functioning properly. Also, if you notice your dog is showing signs of eye issues, such as scratching, excessive blinking, or watering of the eye, it should be taken to a vet immediately. Healthy Sealyham Terriers will live for approximately 11 to 13 years. The actual documented history of this breed dates back to the mid 1800s. It took Captain Edwardes of Sealyham 41 years of his life to developed this breed exactly how he wanted it. The breeds that genetically make up the Sealyham is currently unknown because of the many different types that were thrown into the mix. Many say that the Dandie Dinmont has a significant role in the Sealyham’s DNA makeup, but this has not been proven. The AKC recognized the Sealyham in the early 1900s and they became very popular.